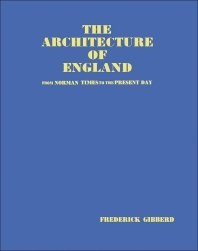 The Architecture of England: From Norman Times to the Present Day provides information pertinent to the evolution of English architecture. This book shows why different building types are erected and explains their significance and characteristics. This book begins with an overview of the architecture of the ancient civilizations of Rome and Greece, which had a great influence on the architecture of England. This text then explains the Anglo-Saxon and Norman architecture, which have their roots in the temples of ancient Greece, while after the Renaissance in Italy classic forms were brought over from that country. This book discusses as well the important structural development made by the Romans, which is the use of the vault and the arch. The reader is also introduced to the utilization of iron and glass by the architect engineers to solve the problems arising from the Industrial Revolution. This book is a valuable resource for architects and engineers.